The new Mazda spot is a direct rip of Feist’s highly choreographed video. Not only do I detest lazy Art Directors but, when are Ad Agencies going to stop using Gospel to sell products. Take a cue from The Church’s Fried Chicken Gospel Dinner Box – it is NOT a good look. The $500 Ghostface Doll Is A P.O.S. 3D scan captures the face, but in the process loses the life. The head makes all the difference. Our advice: hire a sculptor. Ghost! Next time you embark on a creative endeavor check-in with us. The retainer is high but you’ll get sorted out my dude. 4Cast! How many more GFK dolls are going to be created and put into our cultural / historical record? – prolly none – you should have done better. We have developed a rubric that estimates the education level needed to understand each rhyme as well as, rates the artistic sophistication employed through the metaphors, similes, cultural references, consonantal/vocalic alliteration and overall pattern of each rhyme. We calculate the final score by averaging the syntactic (readability measures) and semantic (artistic sophistication) scores of each rhyme. On a scale from 0 (illiterate) to 20 (post-graduate degree). Visit the Hip-Hip Word Count. Sanford Biggers‘ new commissioned piece The Something Suite plays one night only at The Box 11/12/07 and stars: Saul Williams aka Niggy Tardust, Esthero, Shae Fiol, Imani Uzuri, Martin Luther and DJs CX KiDTRONiX and Jahi Sundance. Taking the form of traditional minstrel shows 3-act structure, The Something Suite examines todayâ€™s pop music industry. Not money as in money; but money as in those paper notes that represent the value placed on the time we exchange our day’s lifeforce for. Money in your pocket is stored up time. Vacation time is stored up life that you option to spend at a later date. If you don’t take your vacation time you can cash it in for money. Borrowed money is the act of one person taking the time they have stored up and loaning that resource to another person. Valuing life in terms of money is a bit twisted but doesn’t capitalism rock!? Being paid money for having creative ideas is a mindf@ck. On one hand its just a passing thought that might graduate to be a page in my sketchbook. But on the other hand this idea is the missing component that synthesizes a multi-million dollar ad campaign. ‘Genius does not guarantee success’ and God forbid if you just can’t think of anything on that Tuesday morning meeting. The state of being rich is determined by calculating how long you can live off of how much money or resources you have. How rich are you? One generation rich? One year rich? One month rich, One week rich? One day rich? Wouldn’t it be great to own all of your time? aka ‘Stanky’ rich. Google stock sells for $703/share and is almost as valuable as Gold at $787/ounce. The Dollar is worth .69 against the Euro, a currency that was made public in 2002. 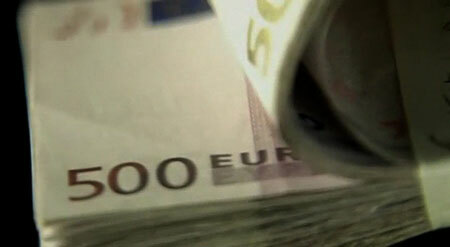 Jay even opted for Euros over Dollars in his video for Blue Magic. $100 saved every month and put into a moderate savings plan, at age 25 will grow into $1Million by age 65. If you start at 35 it will grow to $600K by age 65. $12K a year to educate a NYC H.S. student and $140K a year to jail one. $1Billion a year is what U.S. telephone companies earn selling collect phone calls to prisoners and their families. “Again I saw vanity under the sun: a person who has no one, either son or brother, yet there is no end to all his toil, and his eyes are never satisfied with riches, so that he never asks, “For whom am I toiling and depriving myself of pleasure?” This also is vanity and unhappy business.” (Ecclesiastes).